Is marijuana paleo? How does it affect fat loss? I'm assuming good ol' mary jane is pretty paleo. I go through periods of smoking it and then not, just a puff at night/ before bed, it helps me sleep. Other than a possible case of "the munchies", how does it affect fat loss? Does it slow down my metabolism? If so, is it significant enough to avoid? What has been your experience? The point wasn't that weed and smoking crack are the same. It's just dumb to ask if smoking pot is Paleo. Can you point to ANY compelling evidence that small quantities of marijuana are harmful to the human body? I'd be curious to see it. I've searched far and wide and found absolutely nothing aside from vague reference to lung/trachea damage being possible with VERY excessive consumption. Even lung damage is questionable with small doses or the use of a water pipe or vaporizer. Omega 6 is absorbed through smoke? Am I missing something? LD-50 is a useful measure for drug toxicity, but it's not relevant to any other health concerns. Pure fructose has an immense LD-50, but that doesn't mean it's harmless to eat large amounts. For what it's worth I work with schizophrenics and for about 4 in 5 of the male population it was marijuana usage that was the trigger. That said, clearly the majority of people at large don't have the genetic marker that results in this tragedy for this particular demographic. What's difficult is that in young men who use a fair amount, the passage from "paranoid" to "psychotic break" can be too quick to see it coming. But no question at all that even recreational marijuana use will be the principle trigger for a large number of people who have the genetic potential to develop schizophrenia. Wow, indigenous people are "still a bunch of losers"? That statement is ignorant on so many levels. I suggest coming down from your high horse and reading "Guns, Germs, & Steel" by Jared Diamond to get some perspective on how "we" became "winners". "destroyed by mental illness because of cannabis use" - People act like mental illness is a quantified and catergorised phenomena. Wait until they actually understand what causes mental illness, functionally before making claims about what causes what. Certainly in terms of psychosis, bi polar, schizoprenia. Those are really just words for a mystery. As for anxiety, yeah thats simpler. Pot has a reverse gaba effect, and can exacerbate anxiety. Maybe that is why they are indigenous. Although we can learn a lot from them, they are still a bunch of losers. It CAN be a trigger for depression and anxiety for some but is the best treatment for others. Just because it caused you adverse effects doesn't mean it will do the same to the next person. Family history for psychotic disorders has also been present in every case I have seen where marijuana or another psychoactive substance may have triggered or brought out a serious mental illness. Who said anything about dying? I'm talking about quality of life here, which would include no mental illness. It is a mind altering substance. It can alter your mind. Sheesh! Save your lungs and VAPE it! I understand that also there would be many contributing factors to the whole thing, like pre-disposition, diet etc, but it's no coincidence that when I gave up smoking skunk my anxiety disorder DRAMATICALLY reduced and if I ever dabbled after this (I never do now) the panic attack would come on within minutes of smoking it. People want to smoke it so bad they feel they have to justify it with bizarre reasons "oh but ancient man smoked it" What does that even mean?! Nothing!! You do what you want but don't kid yourself that it's a healthy past time. Also it depends on the strength, my anxiety would be dreadful with skunk and not so bad with a bit of solid which is much weaker. Skunk, whether home grown or not DESTROYED my state of mind after ten years of smoking it, I promise you. You say that but towards the end of my ten year usage I would literally have a panic attack EVERYTIME I sparked up. Directly correlated. I get that's n=1 but you are naive to think a MIND ALTERING SUBSTANCE won't affect YOUR MIND. Think about it. Doesn't mean it was good for them? They also practiced violence and murder but I'm not about to start that either. Weak. Oh dear. Yes ok then, it's good for you because "ancient man" smoked it. You go smoke as much as you want then on that philosophy and I'll carry on making my descisions based on SCIENCE. Ancient man smoked/smokes all kinds of substances to talk to their gods. You can't get much more paleo than that, and every thing we put into our bodies is harmful to some degree or another. Are you going to stop putting everything into your body??? +1 Ruby for rational thinking. "With visible breath I pray." Do a google search on that. Pretty damn paleo if you ask me. By the way, Northern Europeans (both Germanic and Celtic) originated in Northern India. And they had a very powerful drug that used cannabis as one of it's main ingredients. Use that however you want. I'm celiac as well, and MJ has been a godsend. I find I don't even like it as much recreation-wise these days, but as a medical tool its probably the safest substance I've used to combat my lingering GI issues. Haha, so I got down-voted twice for this ... lovely. I didn't realize that other folks smoked marijuana to help with GI issues. For a long time I smoked daily because it was the only thing that I found that kept me regular. Eventually I realized I had celiac disease, cut gluten out, and then cut my marijuana usage down to just occasional, recreational use. Yeah, folks are always on here asking 'is X paleo?' or 'is Y paleo?'. I've never gotten the impression that they were trying to justify something. Folks are just trying to figure out what's healthy and what's not. @cliff- I think your probably right about it not being much different today than back then. However Mei is right about the fertilizers/pesticides. I've personally backpacked out the waste from half a dozen+ illegal wilderness grows here- lots of fert/pest containers. @Mei- Weed is no different than from the 70's, that is DARE propaganda. Ideally go through a grower you know (or dispensary if you live in CO). You get past all the iffy social stuff as well. Really? If I recall correctly we are so good at digesting sugar we can break complex molecules of "sugars" down. We can even break down protein to sugar if needed. What about camp fires? Unless you grow your own, chances are that you are sponsoring misery and death in third world countries. In my country, Brazil, 50.000 people are murdered each year due to violence, mostly from drug wars. I think oak's trying to say that no matter what you do, make sure you're doing it in the safest way possible, ie going through a dealer that isn't cutting your stuff/using fertilizers, pesticides etc. And, similar to contemporary fruit, the weed we smoke today is very different that the weed people smoked as recently as the 70s. Um, I disagree. It is suggestive of drug use during the paleolithic, of which I have no doubt. And besides that, it was interesting, which is sometimes more important than directly answering questions. People look for justification for their actions here all of the time: should I eat this; am I exercising too much or not enough; did I get the right blood tests; hack my food log; etc. Why is a question about marijuana any different? Can the question be answered here without a moral judgement being made based on current mores? I'm not promoting its use. 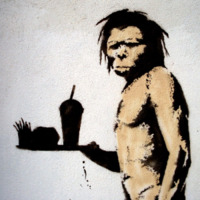 My thinking is this: Let's be careful to judge what is or is not "paleo". We have no idea of the cultural variations 30,000 years ago. Do want to become as dogmatic as militant vegans, easily combustible fuel for media caricatures? My answer was short because I was pressed for time, but I don't care if anyone smokes weed or does any other thing that is illegal as long as it does not affect me or my family. I also believe drugs should be legalized. My point was if you want to do something, then just do it. Don't look for an online community to justify your actions. Secondly, calling smoking marijuana paleo brings bigger issues instead of diet and health. I liken this to the paleo 2.0/archevore name change because too many things get lumped into the paleo lifestyle. Sorry I offended some. Wouldn't it be difficult to say that mental illness is caused by marijuana use? With so many confounding factors (diet, for example), and the possibility that those already suffering from mental distress might be more drawn to/open to drug use as a way of medicating themselves? My own anxiety disorder has been much improved with the help of occasional, very intentional (ie not at parties, or mixed with other drugs) use of marijuana. I don't think one can automatically deem it non-Paleo because "it's bad for you." What's paleo has an element of subjectivity to it. There is no single definition or set of unbending parameters that strictly define it. We have guiding principles that we all follow (no processed sugar, no gluten, etc. etc. ), and that's it. There rest is up to the individual. That's because we have to undo so much cultural conditioning. It's not easy without the help of the psychedelic plants that paleo men used. This doesn't answer the question at all. :) True Ikco. I did note that it was 'straight up from my health course' with reason, however, I do not think that everything CW claims is false. I have not done any thorough research on marijuana, perhaps I will do so in the future, but I stand by what I said: there are better ways to aide sleep and reap the "positive" benefits of using marijuana, and they don't have the list of ailments I mentioned above. It seems, despite being adults and "thinking with our own head", we still can't have a serious debate about drugs. Clearly you want to do this, so go ahead. But why the need to label it Paleo??? Good grief. So, yeah, mth, sorry if I misunderstood your point. As Carly will point out, I am addled in the brain due to my drug addiction. Somebody give me a shot of thorazine quick, the demons arrive! @justanotherhunt: you are right. However, given the poisonous amount of Omega 6 that there must be in less than a gram of marijuana, I would think that even touching the stuff could be fatal ;) @Carly: why thank you! Ever since I got my California 420 card, I have become quite the expert! Pity that I have nothing to look forward to than lung cancer and a future in the mental hospital! Carly, don't project what was obviously an addiction on other people. If somebody takes a glass of wine every now and then, it doesn't make them an alcoholic. If somebody takes a bong hit every now and then, it doesn't make them a marijuana addict. I smoke about once a week, FYI. I was obviously stoned when I wrote that so what do you expect! you go girl! plus one! Actually I grew alot of it myself and no chemicals were added. I guarantee that you were getting it illegally which means who knows what crap was in it. Just like conventionally grown meat there was probably many many unnatural things and chemicals added to it. Also if you got it illegally you were getting indica as sativa is hard to grow. Most positive mental effects come from sativa. Sativa is anti-anxiety, indica can cause anxiety just black tea can cause anxiety but chamomile tea calms the mind. You take take your uncontrolled experiment with illegally obtained cannabis amd compare it to controlled studies of oraganically grown cannabis. "Those studies like the negative marijuana studies have been shown to be bad science with a political agenda" massively generalised sweeping statement. My cousin delveloped severe mental illness because of cannabis, it gave me an anxiety disorder I still haven't managed to entirely shake off, I know a doctor who has lost count of the amount of young people's lives that have been destroyed by mental illness because of cannabis use, and that's not even starting on the detrimental affects of the smoke in the lungs, you are kidding yourself if you think it's healthy. I'm no expert, but lung disease doesn't seem to be a necessary result of pot usage. Plus you can eat brownies and avoid the lung issues. Mental illness rates probably don't approach that related to alcohol, and the relationship is highly confounded. Do you have bad experiences with pot, Carly? I don't have much experience at all, but many many people use it for medicinal purposes. Pot works better than the leading drug in a couple therapeutic classes, and it seems the only things holding back greater adoption is stigma, big pharma, and the government. You can also find just as many studies linking high fat diets and meat consumption as having detrimental effects. Those studies like the negative marijuana studies have been shown to be bad science with a political agenda. Also just like eating the fat and meat of conventionally grown animals can indeed be bad for you, smoking marijuana can also be bad. Good thing there is organic meat and vaporizers and edible cannabis. No, just potentially lung diseases and/or mental illness. It wasn't moderation, I was an addict. An addict who came out with all the same excuses and justifications Thomas is. Which is my comparison, the exuses, not the amount of use. Geoff, you could easily find as many, if not more, studies showing the detrimental effects. Daily use for a decade doesn't sound like moderation to me. I'm not sure your difficulty with cannabis applies to Thomas' situation. Ooh Thomas you are so cool and know so much about pot. Thomas, you clearly didn't read the answer properly, mth didn't ask you to stop smoking it, or behave, just to stop portraying it as paleo. Because it's not. So we are supposed to "BEHAVE" because we might make a bad impression on the media. Wow. What's next? Do we have to take a vow that we are all White, Christian Heterosexuals so that we can make the media think we are "normal"? Many people benefit from consuming marijuana. "Benefit" can mean directly benefiting their physical health or just providing fun. Obviously, though, if you start smoking it chronically, every day, all the time, that could have deleterious effects. Well, you are right that we shouldn't "ape" H-G culture. So whether or not, marijuana is Paleo is sort of beside the question. However, I beg to differ with you on the question as to whether it is healthy or not. Many things that are healthy in moderation become unhealthy when done in excess. The weight-training I do benefits me at 3 times a week of 45-60 minute sessions. Let's say I start to train 4 hours every day. In that case, it will probably do me a lot of harm. ouch! - sounds a wee bit judgmental to me! so Omega 6 and THC is equivalent to arsenic? lol!!!! Any non essential omega six is not good......it's akin to asking what does of arsenic is ok for me to take? Use by "ancient" or "primitive" cultures doesn't really justify it as paleo, and even so, and evolutionary adaptation would really only affect the people that were exposed to it, and in this case, people living in India during this time period, and their descendants. And even if it has ZERO "BENEFITS" to the SERIOUS WORLD, smoking marijuana every now and then is just plain old fun. And fun is something I want to have. "Puritanism is the terrible suspicion that somebody, somewhere might be having fun." If eaten though, in the small amounts that it takes to get you high, how much Omega 6 would you take in? Not much, methinks. "Cannabis was used in Indian culture as early as 3000 BCE, or even more, going back to primitve societies of pre-vedic India. Its ancient use is thus confirmed even in the oldest existing texts, the Vedas -- (Sama Veda, Rig Veda, and Atharva Veda)"
The use of psychedelic drugs is nearly ubiquitous among indigenous peoples worldwide. What was also ubiquitous was that use was grounded in cultural traditions of healing, worship, and community. My point is that the context is as important as the content. The same substance, whether it is pot or sugar can be consumed responsibly by some, while others, due to heredity, environment, or trauma are drawn into addictions. Outside of emotional, legal, or political perspectives, the actual plant, cannabis sativa, is essentially harmless. The LD-50 (dose required to kill 50% of lab animals) is so high that it is essentially impossible to overdose. It is much easier to overdose on coffee than it is on cannabis. If you want to smoke it, then just smoke it. Please quit justifying it as paleo - you will end up making us look more crazy than we are portrayed in the media. Adding smoke to the lungs will never be good for any kind of result, we are not designed to breathe smoke. We are not built to eat grain. Our system is not made to digest sugars. Paleo is Paleo due to a concept based on fact and science, not to be trendy. Of course it isn't "paleo", what ever that actually is, nor is it healthy, no matter how you dress it up or how many tribes you an find that may or may not have smoked it. If you wanty to minimise the harmful affects on your lungs you can use a vaporiser (Robb Wolf talked about this a couple of podcasts back) but it is still harmful, unhealthy and not paleo. I used to smoke it myself so I'm not judging anybody I just think it's silly to try and pretend it's not harmful. I couldn't find much on the web about evidence of cannabis being used. It seems like it could have been and I'm sure paleoithic man would have found it useful. I wonder if there's any evidence of paleoithic man smoking. They could have made "chillums" with wood or used leaves to roll cannabis. Orally cannabis isn't active unless cooked in fat I wonder if paleoithic man knew that. Psychedelics such as psilocybin and amanita muscaria mushrooms were both consumed during palaeolithic times for shamanistic rituals, dancing and healing. They also probably used lower doses of these to "get high" or increase energy/senses. So at least lower doses are fairly cannabis-like. First of all, stop talking about the smoke factor. I am pretty sure that Paleos had their marijuana as edibles (possibly brownies :). Chronic smoking of marijuana may not be healthy. However, it does not follow that if x=100 is bad that x = 10 is also bad. Dosage is EVERYTHING and the field of hormesis seems to be making that point. However, there is another factor: MANY people have had revelations using entheogens like psilocbyin mushrooms and ayahuasca and even marijuana (check out the late Carl Sagan's insistence about his revelations with marijuana). Of course, I can't prove it, but I would think that quite possible Paleo man may have had similar revelations that would have positively impacted his evolution. Terence McKenna wrote a book on this, called "The Food of the Gods". Of course, we needn't speculate about the past. I think a study of how ayahuasca has been used by the indigenous peoples in the Amazonian rainforests would make this point. Paleo for me is what optimizes me........pot is far from it. It also has some of the highest levels of omega 6 content of any plant just like hemp. Major pass. Just because it was used then does make it paleo. This kinda of stuff has to be self evident.. This is purely from personal experience, but I find cannabis to be a nice alternative to anti-pain and anti-anxiety medications (recovering from a stress-fracture now), and so far it is the ONLY substance that relieves GI-stress associated with accidental gluten exposure. I've tried ginger, peppermint, etc. I find I can get the GI effects from a single puff?? ?definitely not enough to produce a high. Probably not so good for the lungs, but vaporizers and edibles are definitely other options. During the Paleolithic, there is ample evidence of drug use as seen by preserved botanical remains and coprolites. Some scholars suggest that the Shanidar Cave (a Paleolithic site in Iraq) Flower Burial shows evidence of a shamanic death ritual, but these claims are still being debated. The most direct evidence we have from the Paleolithic in terms of art comes from Tassili, Algeria. From this region, there are several therianthropic images portraying the painter and the animals around him as one (an often cited effect of many hallucinatory drugs, Ego death). One image, in particular, shows a man who has formed into one common form with a mushroom. There are several Paleolithic sites that display therianthropic imagery. However, there is some debate as to whether or not sites like Lascaux or Chauvet were entheogenically inspired. I'm suprised at the question. Some ancient cultures practiced genocide does that make it ok? I was just reading today somewhere about our need to anesthesize our minds. Why? And I am guilty. I am drinking a beer right now after a long day. But no it is definately not paleo, is definately not good for me. My body does not even want it...my mind does. Also read today how modern medicine separates the mind from the body. This is a big error. And I suddenly remembered, I started making ice cubes, which I never use and as of tomorrow........my new treat for spoiling myself will be a tall glass of water with ice cubes and lemon, maybe some fresh mint. It is all in the mind !!!!!!!!!!! Maybe I should buy a new glass...why do we need to dull our senses? I'm sure our paleo friends of way back had plenty of defects.......no reason to take those on as well. I find it interesting that people are so accepting of those who still drink alcohol, but they are all ready to judge you for smoking pot. As far as weight loss, I wouldn't think it would be that conducive to weight loss since it tends to stimulate your appetite. Let's all just chill out here and spark up a doobie. Over here there's hash (Morocco) wanna start analyzing that? I see nothing wrong with an occasional glass of wine, or partaking of a little weed. Every couple months I unwind with a bowl. Is it bad for you? Probably, but so is being wound to tight. I think the benefits of being that relaxed for a short time probably outweigh the negatives. I use edible marijuana products as a pain reliever (if you get the butter you can make Paleo friendly edibles yourself). I used to smoke it all the time, but when i quit smoking cigarettes, I could no longer smoke weed without the association. I agree with some of the other answers, it's all about dosage. Obviously it's not part of my everyday diet and I don't have much when I do eat it. But I have to believe it's far better for me than the pain relievers (Vicodin, Ibuprofen) and anti-anxiety medications (Valium) the doctors push on me. I do get the munchies, though, so I have to be careful. It makes me a little more likely to have a "treat" if it's around me at the time. It's not a great tool for weight loss, but I would say it's a fairly "Paleo" type of medication if you use it correctly. When I was younger I did A LOT of drugs. But nowadays I am just not down with drugs, I really like being 100% clear minded and in control at all times. I feel really happy with sobriety, it has helped me better myself in many ways. Although I believe in free will and say to each his/her own, if someone wants to smoke then so be it. Drugs are not for me. As far as "pot being paleo" I am sure it's been used since it was discovered and well it has it's pros and cons as with just about everything else. So a person must make up their own mind on this subject. High rate of birth defects among children who's mothers smoked marijuana during pregnancy. By saying 'a puff at night' sometimes, it doesn't seem like you are taking in large doses. However, over time, the negative effects build up. A paleolithic Homo sapien did not chill out smoking weed, the would have gotten eaten. Smoke it if you want, but I wouldn't recommend it - there are better ways to aide sleep and reap the "positive" benefits of using marijuana, and they don't have the list of ailments I mentioned above. Open up any old national geographic and tribes people are smoking something. Why? Because they enjoy it and it's a social thing to do, not because it's packed with antioxidants. So fire one up and everyone lighten up. There are many who say that drugs are the fifth human need, after air, water, food and sleep. You can argue about it until you are blue in the face but it is a fact of life that humans got buzzed for thousands of generations by the wild vegetables they ate. And all vegetables have these toxins, because no creature wants to be eaten. Even fruits, who want to be eaten, have them. Apples have high contents of malic acid to discourage the bugs that tunnel to the core to eat the immature seeds. Some of the compounds, toxic to classes of bugs, actually have medicinal or nutritional properties in the human body. And we have come to crave and need these compounds. We can all digest meat and marrow, and that is clear cut and not worth debating, but when it comes to the vegetables, thousands of books could be written about what is optimal, and probably genetic makeup matters a lot. So marijuana is only the tip of the iceberg. To get a perfectly legal buzz, roast a head of garlic, top removed, in an enclosed container in the oven, then eat it. Do it on a Friday night so no one will object at work. My wild celery (smallage) is pretty strong stuff too (I grow several lbs a year). To answer the original post for the author, when I was 18 or 19, I began smoking around 3 cigarettes a day, as well as frequent cannabis. I became much skinnier and lost lots of fat. Malnutrition due to pleasure smoking over food? I'm not sure. However, cannabis may be beneficial for fat loss. Is doing crack in the back alley with a crab infested whore Paleo? I became Paleo because of Dr. Terry Wahls' Ted Talk, and because she used it to treat her multiple sclerosis, which I also have. I had already eliminated all dairy from my diet because of the medical phenomenon of molecular mimicry, which suggests that dairy use triggers MS when other factors are also present. Ten years ago, a scientific friend sent me a clipping from the MIT Alumni paper that quoted MIT research in cannabis as a neuroprotector for MS. Since then, I have provided myself with a daily treatment. The naysayers on this thread impress me as uninformed scaremongers without a scientific basis for their rants. I can see that nothing about my position is yet fully proven, but my response to this question is "Of course, pot is Paleo," and I believe that the evidence in this thread that supports my response far outways any evidence against it. I began eating Paleo because of the Dr. Terry Wahls Ted Talk video, because like her, I have multiple sclerosis. However, I had already quit all dairy because of research into molelar mimicry and MS.
Over ten years ago, a scientific friend sent me a clipping that showed research from MIT that cannabis protected your brain from deterioration in MS, and I began daily treatments--always small. My lifestyle choices are about the best science I can find, and that's why I'm Paleo. The naysayers on this thread appear to me to be reactionary and unscientific in their views. Historic evidence, combined with medical science, leads me to believe that of course, pot is Paleo. Why would anyone doubt it? some good reponses already. It obviously does not matter if it is 'paleo' or not. I don't think that would make a difference, mmmmm is slavery paleo? The health benefits associated with cannabis are great in number, but please remember that this is when the plant is eaten either as a solid or an oil, not when smoked. It is also not aligned with getting high. Few people actually report getting high when cannabis is part of their diet. Dear * Modern Marijuana is highly processed. So its not the good old ganja from the seventies. Its if its bad it grown in laboratories. And worse delaer put lead or hairspray or sand to it. So * Take Drugs seriously*!!!!!! !